On 12 October 2000, Cole was the target of a terrorist attack carried out by al-Qaeda in the Yemeni port of Aden, when two suicide bombers detonated explosives carried in a small boat near the warship, killing 17 sailors, injuring 39 others, and damaging the ship. On 29 November 2003, Cole deployed for her first overseas deployment after the bombing and subsequently returned to her homeport of Norfolk, Virginia, on 27 May 2004 without incident. The cruise missile strikes carried out by the U.S. Navy in Yemen has sparked outrage from all sides in the conflict. Kofi Atta Annan (born 8 April 1938) is a Ghanaian diplomat who served as the seventh Secretary-General of the United Nations from January 1997 to December 2006. Annan, along with the UN, were the co-recipients of the 2001 Nobel Peace Prize. He is the founder and the Chairman of the Kofi Annan Foundation, as well as being the chairman of The Elders, a group founded by Nelson Mandela. Born in Kumasi, Annan went on to study economics at Macalester College, international relations from the Graduate Institute Genevaand management at MIT. 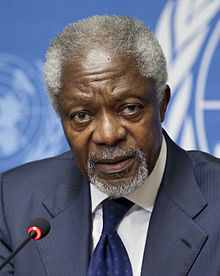 Annan joined the UN in 1962, working for the World Health Organization‘s Geneva office. He went on to work in several capacities at the UN Headquarters including serving as the Under-Secretary-General for peacekeeping between March 1992 and December 1996. He was appointed as the Secretary-General on 13 December 1996 by the Security Council, and later confirmed by the General Assembly, making him the first office holder to be elected from the UN staff itself. He was re-elected for a second term in 2001, and was succeed as Secretary-General by Ban Ki-moon on 1 January 2007. As the Secretary-General, Annan reformed the UN bureaucracy; worked to combat HIV, especially in Africa; and launched the UN Global Compact. He has been criticized for not expanding the Security Council and faced calls for resignation after an investigation into the Oil-for-Food Programme. After leaving the UN, he founded the Kofi Annan Foundation in 2007 to work on international development. In 2012, Annan was the UN–Arab League Joint Special Representative for Syria, to help find a resolution to ongoing conflict there. Annan quit after becoming frustrated with the UN’s lack of progress with regard to conflict resolution. In September 2016, Annan was appointed to lead a UN commission to investigate the Rohingya crisis.